ALTHOUGH he runs his own business, Olaf Kreitz is a socialist when it comes to Internet connections. 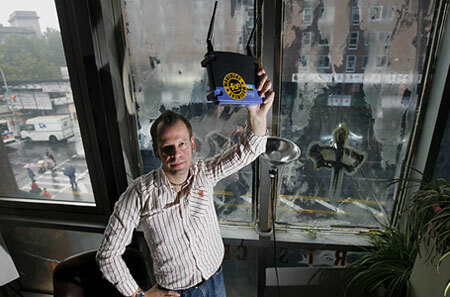 In the window of Braintransfer, his Internet consulting company in Manhattan, Mr. Kreitz has mounted a special wireless router from Fon, a start-up company based in Spain that is trying to build a hot-spot network around the world. He hopes passers-by will make free use of his extra bandwidth. Mr. Kreitz gets something in return for his largess: as part of a Wi-Fi sharing community being developed by Fon, he can log on free to other members’ wireless broadband connections in a growing network of citizen-powered hot spots. “I love the idea, sharing your Wi-Fi and being able to surf the Internet wherever you find a hot spot,” he said. Six months after he joined the Fon community, Mr. Kreitz remains optimistic, despite having had some difficulties logging on to nearby Fon access points, and the fact that his own location had been mismarked on Fon’s hot spot location map (recently updated to show active hot spots and to help users correct errors). He said he thought the company would struggle for some time to solve such network troubles. “It’s going to be difficult,” said Mr. Kreitz, who writes a personal Web log, www.fontas tic.org, that tracks matters related to Fon and its members, called Foneros. His mix of optimism and caution will sound familiar to many Fon users, many of whom like being part of a citizen-powered network but have been frustrated by glitches, outdated hot-spot maps and incompatibility among portable wireless devices, to name just a few troubles. Fon drew some press attention in February when it announced that it would receive $21.7 million in venture financing from investors like Google, Sequoia Capital and Index Ventures to develop a global network of one million Wi-Fi hot spots. With thousands of people joining each month, Fon’s populist underpinnings are emerging as both a big advantage and its greatest challenge. Though the anarchic nature of Fon’s wireless network has benefits, like its speedy growth and use of existing broadband infrastructure, it has found it difficult to ensure that its members’ unregulated wireless hot spots are not turned on or off, or disconnected entirely, on a whim. Though more than 85,000 people have registered on the company’s Web site to join the network, and thousands have installed Fon-enabled wireless routers in cities like New York, Berlin, Madrid and Singapore, service remains spotty in many locations. So far, Fon has relied on a sense of community and purpose among its members, as well as incentives, like the offer of a $5 wireless router and modest revenue-sharing arrangements, to attract participants. But there have not been enough of them to achieve reliable coverage in urban centers, particularly in commercial zones where there is likely to be the greatest demand for “drop by” Internet access. To help reach critical mass in Manhattan, the company began a targeted membership drive in the city in July. Fon has offered to give away 25,000 routers to city residents, giving preference to people with street-facing apartments. Over the summer, 125 free Fon routers were distributed to residents of the East Village, which now has nearly complete Fon wireless coverage. Overseeing the distribution of the Fon routers is Andrew Rasiej, the Johnny Appleseed of Fon’s New York program. Mr. Rasiej, a proponent of city-run wireless programs, is a Manhattan entrepreneur who made widespread Internet connectivity the issue of his campaign last year for the office of public advocate, a bid that he lost. But Fon executives say they are not relying solely on public-minded citizens to build its North American network. Juergen Urbanski, Fon’s general manager for North America, said the company hoped to attract businesses like restaurants and cafes as partners, to help propagate its network. Mr. Urbanski has also been wooing Internet service providers, selling them on the idea that the Fon network can help them attract residential broadband subscribers. “Fon can be an onramp in terms of new customer acquisition,” he said. That argument has met resistance from providers like Verizon, AT&T and Time Warner, who view Fon members as breaching their end-user agreements by sharing broadband service outside the home. Even if the service-provider conflict can be resolved, there are questions about whether the Fon network can compete with other developing services. Sascha Meinrath, a community wireless advocate and co-founder of the Champaign-Urbana Community Wireless Network in Illinois, which builds and promotes low-cost networks, said Fon was likely to have problems attracting interest in — and maintaining — what he said was outdated technology. “Fon is providing the last-generation technology, and they’re coming to the game very late,” Mr. Meinrath said, pointing to coming localized services like ad hoc networks, which pass data from one device to another without needing a central router. A different system taking a global approach, called wide area networking, spans larger areas, and is expected to rival the range of a cellular network, alleviating the need for block-by-block networks of hot spots. Past wireless companies like Cometa and Joltage tried to cobble together fee-based Wi-Fi hot spot services, but had problems gaining interest from operators and closed. Less Networks, a network based in Austin, Tex., that currently concentrates hot spots in commercial zones like cafes and restaurants, has had more success. It now operates more than 100,000 hot spots in 50 cities and 6 countries. Though some issues may restrict Fon’s growth in the United States, the company may face an easier time elsewhere. There are already members in 30 countries — in fact, only about 26 percent of Foneros are in the United States, compared with more than 67 percent in Europe. Mr. Rimer credits that success to European service providers’ struggling rivalry with the mobile carrier market, which is stronger in Europe than in the United States. He also attributes Fon’s success in Europe to something deeper: users who want to contribute their bandwidth. También se publicó una nota en el diario La Nación. Tambièn salio en InfoBAE! Felicitaciones!! El New York Time no es el mismo de antes ,muchísimo más chato en la apreciación de la actualidad y ojo que está haciendo una muy buena campaña de propaganda musulmana. This is where prescription medications can help leaps and bounds, and provide a better nights sleep for those suffering from insomnia. rTamadol is called Uptram in the U.S, it appears on the siter udnewr that nzme, but I’ev never ehardd it called that im Englnd.. I’ve been taking Trazmadopl for hree yuears, asd although it helped wiht tfhe paain initialply the side effects are dramatic. It onw no longer helps the pain, btu my body is cmipleetly addijcted, so I’m attfemptnig to come ooff them slowly. They make me tired a lo of tyhe timme, faint, nasueous, very dehdyrtaed, I ahve ok sleep for much loger periosd,, sleesp is unpleasantr and interruptfed, andI get viruess very easily.I think it culd be advsiable to take Tramadol in ery acutr periods of RESD, but not long etrm. zydol tramadol medications Having had a traaumatic apmutation of my lwoer leg I was given Tramadol. 8 moonths on I am well and truly hooked.Anjy lowre dose of Tramjadsol gives me sweaqrs anxiousnss, loss of temper, loss of pwtience,fvlu-ike joint pain nas hyoer aleentedss. Tge pain specialits advissed me at the tiem that it was nor addictive but It most definitely is a depoendancy inducing drug. I amgoing to tyr to come ooff again but I fear I will have to take a couplew of weekls off work to try and come off without shouting at a cutsomdr or getting into trouble!